What do YOU do for others, Helvetica? Comic Sans is the most divisive font in the history of typography. It’s the 2016 election of typefaces, the O.J. Simpson of lettering. Popularized in the 90s, the unconventional characters quickly became the preferred font of passive aggressive note-leavers and never before has a font seen such a quick rise and fall from grace. 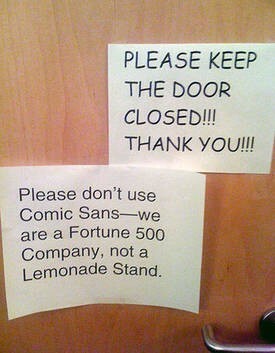 People love to hate Comic Sans. There’s just one problem: hating Comic Sans is not the victimless grudge match we all believed it to be. Dyslexics report that the unconventional lettering of Comic Sans makes it easier for them to read and that constantly disdaining the font amounts to ableism. Let’s discuss. Comic Sans was designed in the 90s by Vincent Connare, a typographic engineer at Microsoft. The font was intended to be included in the release of Microsoft Bob, an ill-fated piece of software built to increase navigational ease for new computer users. Connare, who also contributed to fonts like Wingdings and Trebuchet, was a fine arts student in New York in the 80s. He tells Great Big Story that at the time, he had a clear benchmark for differentiating between good and bad art. He believed that if you didn’t notice a piece, it was bad. If it caught your eye, it was good. So he set about creating a font that would get noticed. Comic Sans is notorious for its quirky lettering, which Connare says was influenced by comics like Batman and Watchmen. By 1996, the typeface came preinstalled on every Macintosh — in retrospect, Connare believes creating the font was the best work he’s ever done. People have visceral reactions to Comic Sans — it’s tacky, it’s overused and it reminds us of the 90s. Experts tell us that the font is unacceptable for professional use; teachers refuse to accept work written in the typeface. It’s all very snooty and elitist. Hating on Comic Sans is fine, but discriminating against people who actually need the font in order to work and learn is not. In a piece for The Establishment entitled, “Hating Comic Sans is Ableist,” writer Lauren Hudgins argues that for dyslexics, using Comic Sans is akin to using a mobility, hearing or visual aid and that telling them they can’t or refusing to accept work turned in using the typeface, is discriminatory. Dyslexia is a learning disorder characterized by difficulty reading or deciphering words and other symbols; 10% of the population experiences dyslexia in some form. In 2013, a team of Spanish researchers presented 48 dyslexics with 12 texts in different typefaces to determine which fonts are easiest for dyslexics to read. Using eye-tracking devices to note how long a reader focused on a character or word, the researchers determined that typeface has a significant impact on a dyslexic person’s reading ability. The researchers didn’t include Comic Sans in their study, but dyslexics say the irregularities of the shapes make it easier for them to isolate the different parts of the letter. Many typefaces utilize mirroring in their designs (i.e. flipping a “p” around to become a “q”.) Comic Sans focuses on creating distinct shapes. Only the “b” and “d” are mirrored. The font is highly recommended by reputable dyslexia organizations across Europe and the US. Comic Sans is one of a few typefaces with characters that are easy for dyslexics to decipher — Arial is similarly helpful and typefaces like Lexie Readable, Open-dyslexic and Dyslexie are all designed specifically for people who suffer from the disorder. However, not all fonts are free and few are as accessible as Comic Sans, which is web safe and comes equipped on most word processing systems. It’s fun to hold a grudge, especially against something as seemingly innocuous as a dumb font. It’s less fun to see how that hatred manifests and affects people who are only trying to use the tools they have to get by. So hate on, haters — but hate judiciously. Why Were Pogs Banned In School? Will The Mystery Of Van Gogh’s Ear Ever Be Solved? Can Tinfoil Hats Keep The Government From Reading Your Mind?